Implementation of permaculture projects is moving along well this summer. 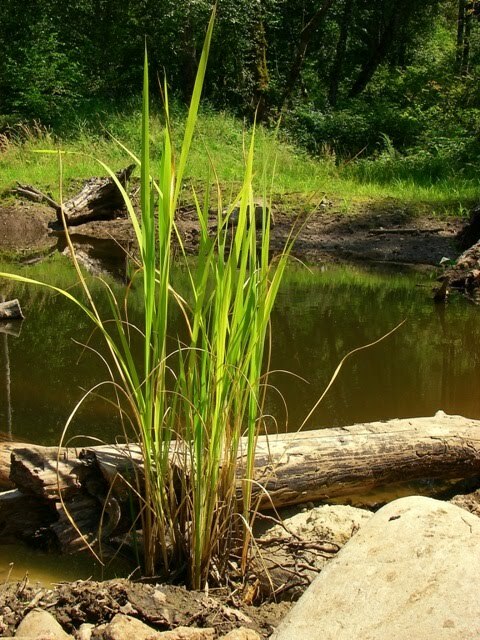 We've introduced a variety native and cultivated edible, medicinal, and utilitarian aquatic plants into the new ponds - including wapato, perennial wild rice, aronia, arrowhead, cattail, bulrush, and much more. 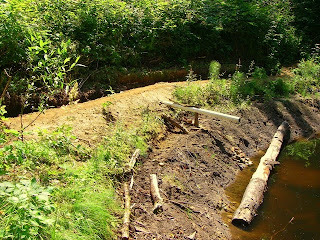 We've also added a water collection swale and berm to funnel water to oxygenate the pond. Next spring we hope to have enough plant life and oxygen to be able to introduce fish for a complete aquaculture system! Pictured above is one of our new wapato plants. Wapato has a tasty edible tuber that was a staple food for indigenous people of the northwest. The Japanese have also cultivated a close relative as a food plant. It also provides important wildlife habitat. 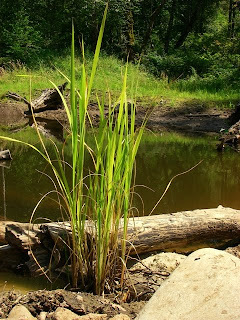 Pictured here is a perennial wild rice plant that we added to the new ponds. This plant is native to the western Great Lakes region and the grains can be harvested as an extra tasty and nutritious variety of rice - considered gourmet by many. Native Americans of the midwest harvested it in large quantities from canoes. Permaculturists in North American have been experimenting with cultivating this unique aquatic plant. Pictured above is the new swale, berm, and pipe - which will help to oxygenate the water once the rains return in the fall (an important need for having fish). A solar pump will be utilized to oxygenate the pond during our summer dry season. 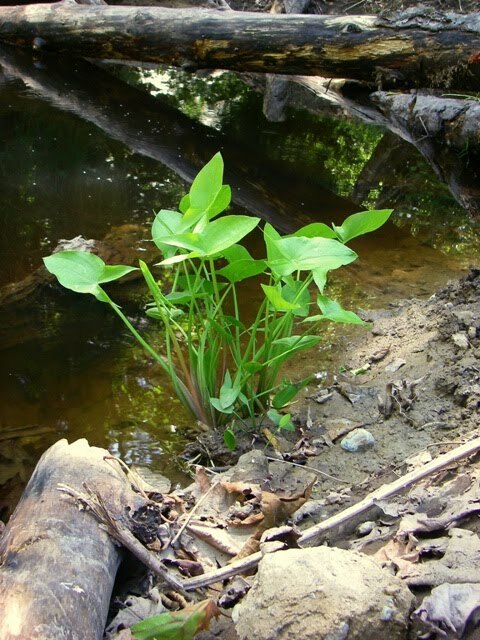 The purpose of the ponds is to provide additional habitat diversity; store water; attract more wildlife; provide more food, medicine, and materials for people; create additional microclimates; and to raise fish to eat. We're also utilizing a small pond to cultivate duckweed and azolla for chicken feed and natural fertilizer in our compost piles. Vibrant ponds and diverse aquaculture systems are often important components to a holistic permaculture approach to sustainability.